Also, you should check out the Arts Market in Leslieville at 1114 Queen St. E. as some of the artisans, myself included, are having a Cabin Fever February sale with 10% off all of our products! I have a great assortment of wind- and water-resistant hats as well as tea and coffee cosies, and a few ornaments, too! Onto the TWO Instagram challenges! Day 13 of #100nfornaments is a coral monster! Seriously loving making the monsters. Day 12 of #100nfornaments is a spikey blue monster. I knew I made that cotton candy colour for a reason! It’s early on (in the first 2 weeks) and I know that I will likely hit a wall around day 50 but it has given me the motivation to get back to work after a tiring and long December. The next challenge is a group thing that I cooked up a few nights ago. I was wanting to do a collaborative challenge and thought that the Toronto Etsy Street Team members would be good collaborators. So I figured a meet the makers/behind the scenes/introduction challenge would be good. I proposed it on Friday night and got an extremely enthusiastic response. I’ve got a good number of participants joining in, and it starts tomorrow! If you are on Instagram, check us out at the hashtag #WeBeTEST (people who know me well will know that I did not come up with that name – I have a BA(honours) in linguistics and have been accused of being a “semantic warrior” on occasion, but it’s short, fun, cheeky and catchy) and get to know the makers of the Toronto Etsy Street Team. I look forward to seeing all of the creative posts from our team members! And I hope you’ll check us out! I’ve done a few different “challenges” in the past year or so. First there was the 30×30 nature challenge in May 2014. Then there was a 6 week fitness challenge from the Cornerstone Studio in January. Last month there was the May_Be2015 creativity challenge, plus SaluteTheSun21. And now the 100 needle felted ornaments (explained in an earlier post). I like the accountability factor, the prompts and the routine in challenges. The 30×30 nature challenge got me consciously outdoors. We live in an extremely walkable neighbourhood. I hang my laundry on the line once summer hits. We have been hiking with our homeschool group for years. Once the weather gets nice our group heads to the beach on a regular basis. So I am already outdoors quite a bit. But during that challenge I became more aware of my surroundings and started having a bit of morning quiet time on the deck. It was a nice addition to my day and I enjoyed listening to the birds and watching the trees fill out. I also moved my work and the boys’ out to the deck when it was feasible. We started eating 3 meals a day on our deck when the weather was nice and the wasps didn’t chase us back inside. Several of these things stayed until the weather cooled down, and now that spring is back we are starting those things again. The 6 week fitness challenge got me out to different fitness and dance classes 6 days a week for 6 weeks, and I ended up liking it so much that I became a member at the studio. I am there 5 days a week and am still very much enjoying it. The May_Be2015 creative challenge got me drawing (I now carry my sketchbook and pencil wherever I go) and writing in cursive (something I hadn’t done properly in decades) regularly. It made me think about different forms, ideas, printed photographs, and my creative habits/routine (or lack thereof), among other things. SaluteTheSun21 got me out to watch the sun rise. Now whenever I’m awake at 5:15am either due to insomnia or because I mean to, I head down to the beach and watch the sun rise. It is an absolutely fantastic way to start the day. A beautiful promise that every day is a totally different and fresh start. My friend who started the challenge decided on day 22 that she did not want to stop, so she is down at her beach each morning for the dawn of every new day. I’ve seen a lot of sunsets over the years but I’ve got to tell you that the sunrise is a different thing altogether. You should try it sometime. Even if you have to wait until fall when the time of day is a little more reasonable. The common thread? I start these challenges on a whim, and later find that there are lasting benefits and changes with each one. The wool ball series of ornaments started late last year. I was working away making snowmen when I just got tired of it. I was eyeballing this ball (the snowman’s body) and I thought, “What could I make with a wool ball?” Then I proceeded to make a few things (mostly animals) for my next holiday show and my Etsy shop. I ended up madly needle felting ornaments during shows and in the evenings as well. I was playing catch-up so I stuck to the first few animals that I had created: frog, elephant, cardinal, narwhal, robin, penguin, owl, and panda. This year I have started early and have time to explore. Because of this 100 day commitment, my sketchbook is filled with ideas – I need content! About a month ago I was listening to a podcast where the interviewer asked what were the interviewee’s “golden hours” – when a you work the best, you are at your most attentive, and most focussed. I’m not sure if everyone knows their golden hours, but I have known for a long time that I am best in the morning. First thing. It also happens to be a time of day when no one else is up, so it’s a perfect time to get a few things done undisturbed. I hadn’t been using that time productively. But as of 12 days ago, I do. This challenge has forced me into a routine that really works for me. No email, no social media, just my notebook sketches, wool, and tools, until the job is done. And the job is always a fun challenge. With my sketchbook, I have a visual list of creative possibilities from which to choose every day. Now I’ve decided that I’ll try to make 2 of whatever it is I’ve decided to make that day (if I have the time before the family is up) instead of 1, to see how closely I can match the first as well as build up some stock. So the 100 ornaments challenge, by day 10, had changed my routine, just like the other challenges. But it did a few other things as well. I now look forward to getting out of bed, since I have a creative project to get to. I’m keeping on top of creation of the wool balls that are the core of each ornament (a 2 step process that needs lead time: the balls are roughly needle felted, then wet felted and need a couple of days to dry) since I don’t want to run out. I’ve had several people tell me that they look forward to seeing what I’ve created each day, which is such a kick. You guys are fantastic! Thx for the #100NFOrnaments feedback! I think, with my existing sketches (6 pages worth), the suggestions, and a few of the old favourites (snowmen and Santas), I probably have enough to fill my 100 days. What I forgot to mention above is that because I am making something different, and because I am making every single day, I am improving and likely getting more efficient as well. Another added bonus to the challenge! Feel free to follow along on instagram, facebook, or twitter. 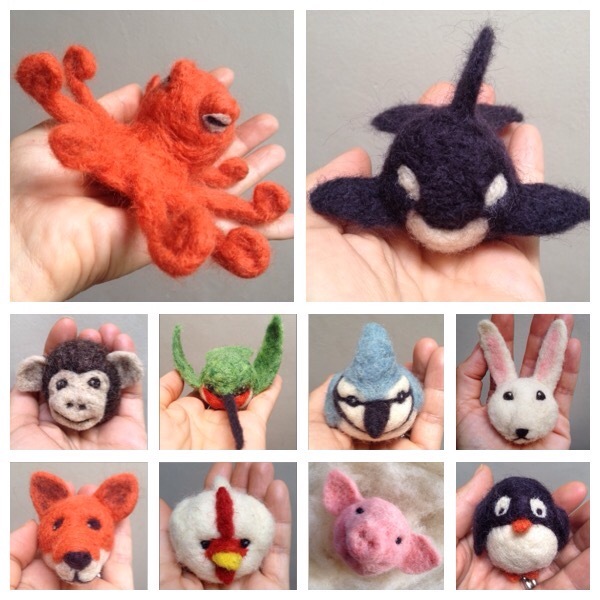 If you have a favourite animal (or other) that you think might work for my Wool Ball ornaments series, please comment. If you’d like to follow along, check out my Instagram feed, or the hashtag #100NFOrnaments. I love that I’m not the only one who has taken the 100 days theme and run with it. One friend is doing 100 days of wild edibles and another is doing 100 things that make her day!